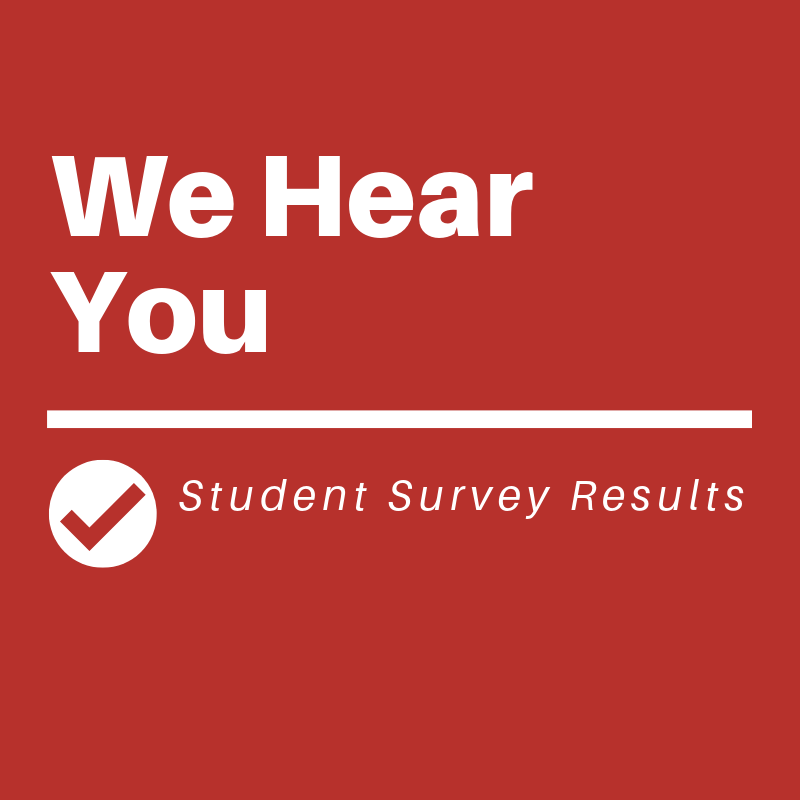 In November 2018, the UDC Library circulated a survey for students so we could learn more about student use of and perspectives on the library. The library’s mission is to help UDC students, faculty, and staff succeed, and with this survey, we sought to find out more about how students currently use library resources and what we could do better to support student success. Many thanks to the 300+ students who responded—we learned a lot from you! We’d like to share some highlights of what we learned and what comes next based on student feedback. We’ll be sharing similar highlights from our survey for UDC faculty in a subsequent post. We see lots of you at the library! 90% of respondents said they have visited the library, and 67% visit at least a few times a semester. The top things you come to the library for are using computers/Wi-Fi for your classes, independent studying, and printing, copying, or scanning. You value many things about the library: Respondents highlighted access to learning resources, computers, printers, and space, and having a quiet atmosphere to do work. You value getting help from library staff and having a clean and safe library. But there are things we can improve: Respondents mentioned that they want to see better wifi service, less noise from the adjacent student center, and better directional signage to guide use of the library. You also said you wanted to be allowed to bring food and drink into the library. Like we do, you miss the study rooms that we had in Building 41 and would like more individual and group study space. The interim library space is good in some ways and challenging in others: Respondents said that our current space is aesthetically nice and feels “more like a library.” But others pointed out that we have less space now and raised concerns about noise and feeling cramped. Improving our Wi-Fi: The library has installed extra Wi-Fi capacity since the survey was circulated. Library users should have much more consistent Wi-Fi coverage now. Reviewing our food and drink policy: Library staff are reviewing food and drink policies at other local libraries and will make a recommendation on whether to change our policy. Helping you navigate the library: There are a lot of things happening in the library and it’s not always clear where to go! We are working on new signs to help you find your way in the library. Getting more space (soon): Our interim space is small, but it will be growing. After the remodel of our space, we expect to have more space for individual and group study—and we’ll have some study rooms again! We are continually reviewing what we do and how we do it to make sure we serve our students the best we can. If you have feedback or suggestions for how we can make the library better, please submit them using our online feedback form or the red suggestion box in the library. If you have any other questions about the survey, please contact Cathy Meals, Reference & Assessment Librarian, at catherine.meals@udc.edu.